We know it’s tough to acknowledge, but school is back in session. If you’re going back yourself, don’t worry: anime will always be there for you when the homework is done and you just can’t brain anymore. 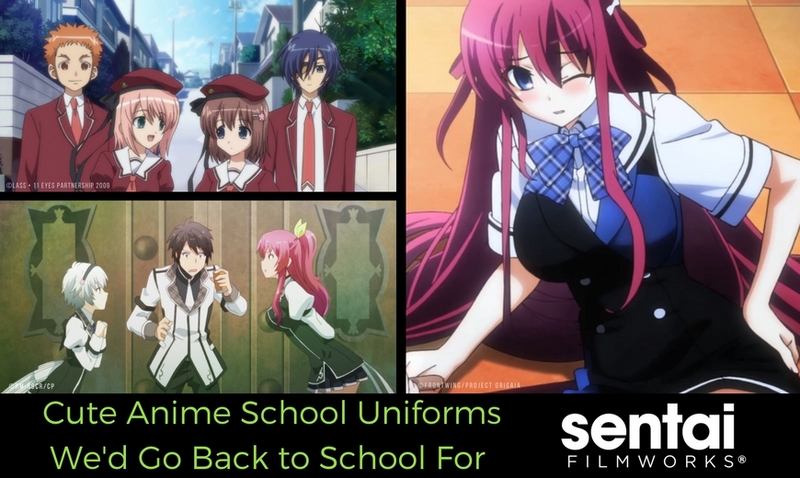 If you’re part of the lucky group that DOESN’T have to worry about going back to school, these anime school uniforms might just tempt you to consider enrolling again. No outfit can prepare someone for a school year fraught with monsters, bloody alternate realities, and sinister enemies. However, Kakeru Satsuki is lucky to have not only an atypical wardrobe, but also his friends and battle party. It might be one hell of a school year, but these guys can handle it. Not to mention: Kakeru gets to use his one good eye to see the girls’ super cute uniforms too. Amidst the technologically advanced ruins, the mecha-armor Dragrides, and the unsteady political climate, these students still look incredible. Undefeated Bahamut Chronicle reinvents the school uniform, transforming it into something much more colorful and interesting than average. As a school made for people who can manifest weapons from their souls, Hagun Academy is definitely not your basic school, and neither are its uniforms. Classy and monochromatic, the patterns and details set this uniform apart from others, even if it’s likely not going to last long in a fight. It’s a wonder that a school for girls even designed a uniform for boys, especially when boys aren’t even supposed to have the powers that these girls do. This school teaches gifted girls to fight utilizing metallic armor. Surpassing the standard issue, these outfits focus on nice lines that are reminiscent of mechas. At Mihama Academy the uniforms might come off as understated. However, each student is allowed to add their own little touch to make their outfit as exclusive as the school they come from. It makes sense, considering there are only six students at the school, and each has some serious issues to work through. Hakoniwa Academy boasts a helpful suggestion box to solve student problems and many dangerous secrets! The Student Council President Medaka Kurokami and her fellow Student Council members may or may not be mentally prepared for their new powers, but at least thier impressively bold uniforms have them dressed for success. Get Your Toast and Don’t Be Late! Whatever your feelings on academia, these shows will make even the most boring school day seem like an adventure! What’s your favorite anime school uniform? Let us know via Facebook, Twitter, Tumblr, and Google+!